Slice tops from peppers, remove seeds, drop into boiling salted water to cover and simmer 5 minutes. (This softens them up a bit.) Drain and then drop in ice water to make them easier to work with. (Hot peppers aren't fun to touch.) Drain and pat dry. Spoon the cheese mixture into the each pepper. Don't overfill. 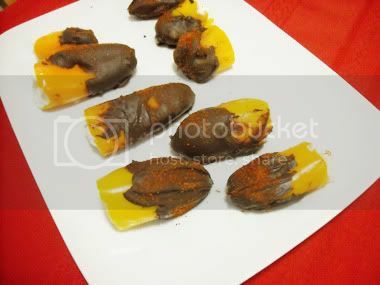 Dip each stuffed pepper in the melted chocolate. (Try not to drop the stuffing in the chocolate.) Lay on a platter, then shake a bit of the chile salt onto them. Let them sit in the fridge for an hour or two to set. In a saucepan over low heat, reduce the balsamic vinegar by two- thirds. Add the chocolate, turn off heat and stir to melt and combine. Cover and set aside. Season the sea scallops with the Adobo and sear them in the olive oil in a nonstick pan on high heat, about 45 seconds per side. Divide the salad evenly among four plates. 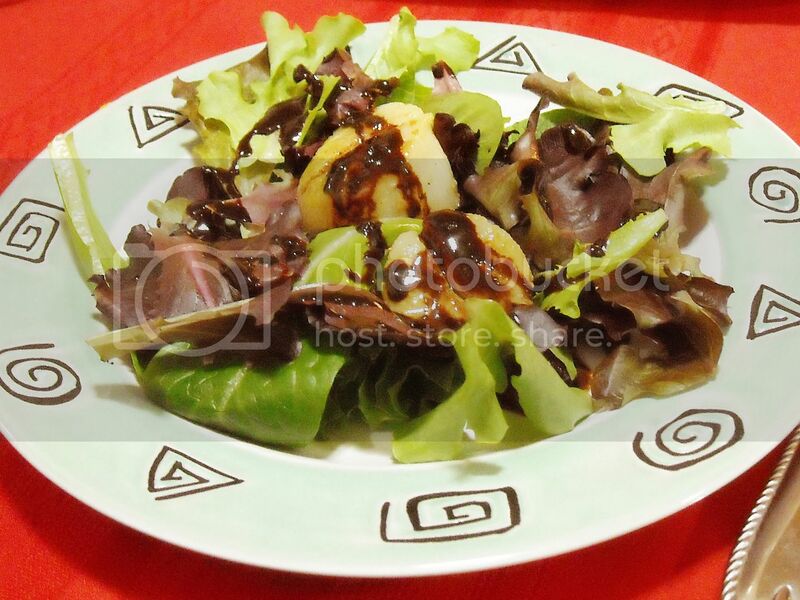 Place two scallops atop each, and drizzle with the slightly warm chocolate-balsamic reduction. And finally for dessert, I tried out Anne Burrell's profiteroles. I'd seen it first on Worst Cooks in America, then again on her Saturday morning show, Secrets of a Restaurant Chef. I'm not a baker, so I had very little faith in these. They turned out to be everyone's favorite part. I followed this recipe exactly, chiefly because I don't like baking and didn't want to screw it up. Except I forgot to add corn syrup. It was fine without. In a small saucepan combine the water, butter and salt and bring to a boil. Reduce the heat and add the flour all at once and stir it vigorously with a wooden spoon. Cook until the mixture has formed a ball and has a slightly sweaty sheen to it and it has pulled away from the pan. Transfer the mixture to a mixing bowl and let cool for 3 to 4 minutes. The mixture does not have to be cold, just cool enough not to cook the eggs when added. Using an electric mixer or lots of good old-fashioned elbow grease, beat in the eggs 1 at a time. Do not add the second egg until the first is fully incorporated. Add in the cinnamon and beat for another second to combine. When ready to serve, cut in half horizontally and fill with ice cream of your choosing. (I prefer a really high-quality vanilla. Ed note: we used Haagen Daz vanilla bean.) Top with warm chocolate sauce. Bring a saucepan with 1-inch of water to a boil. Put the chocolate in a metal or heatproof glass mixing bowl and place on top of the saucepan with boiling water. Pay careful attention that the mixing bowl does not touch the surface of the boiling water. Add the rest of the ingredients and stir until the chocolate has melted and everything is combined. This is a pretty quick process, once the chocolate has melted remove it from the double boiler set up. Spoon over the filled profiteroles. This is best when served warm! 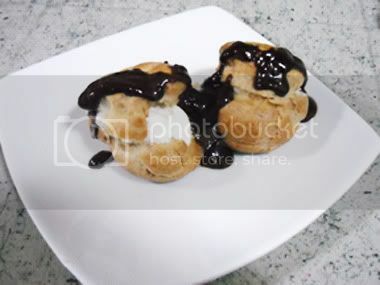 I was able to make 15 profiteroles, serving 3 to each person. The last 3 were scarfed up by one of the judges. He took to simply standing at the counter and dipping them in the chocolate sauce. He might also have half-closed his eyes and moaned a bit. They were really that good. The final score for the evening: I liked the peppers with the cheese, but everyone else would have preferred a sweeter filling. The chocolate balsamic reduction was a slightly sweet and tangy surprise for everyone. And the profiteroles were by far the night's winners. Lessons learned: I won't make chocolate dipped peppers ever again. They were so messy! But I used the balsamic reduction as salad dressing for the rest of the week. I also wish there were leftover profiteroles. But they were so easy to make, they'll reappear in my kitchen again soon. Congrats on the blog! Loved it! Can't wait for the next one. I am going to have to make a reservation to one of those SNTK events! Love the lay out, colors and most of all the name! I really enjoyed how detailed you made the recipes so it's very easy to follow. My suggestions: Maybe make a "star system" but make it cute like how many pots or folks does it deserve. Maybe do something like this at the end of each recipe or end of the night's blog. Other suggestion, maybe get quotes or thoughts on the recipes from your quests to give the blog more depth. I love the blog, and can't wait to keep reading! Well done! Girl + Chocolate = sweet success! If you think this meal SOUNDS delicious, imagine how good it actually tasted! I was lucky to be a guest at the inaugural SNTK, where each item on the menu was yummier than the one before it. I was actually a big fan of the chocolate dipped peppers in particular. Loved how the combination of ingredients tasted together, and I thought the Chile salt was a nice touch to top it off with. Here's to all the SNTKs that are yet to come!